Hey my friends, hope you had a terrific weekend? Happy new month! I’m super excited for this blogger collaboration with Natalie Ast in Toronto. 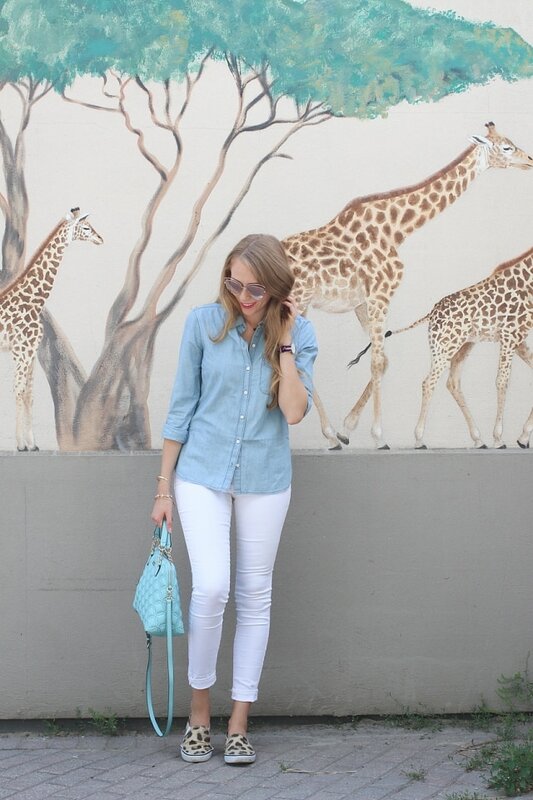 Chambray is a timeless piece and a must-have in every closet. For this collab, we chose to create a chambray shirt outfit worn according to our personal style. Natalie is the fashion, brains, and beauty behind Natalieast. 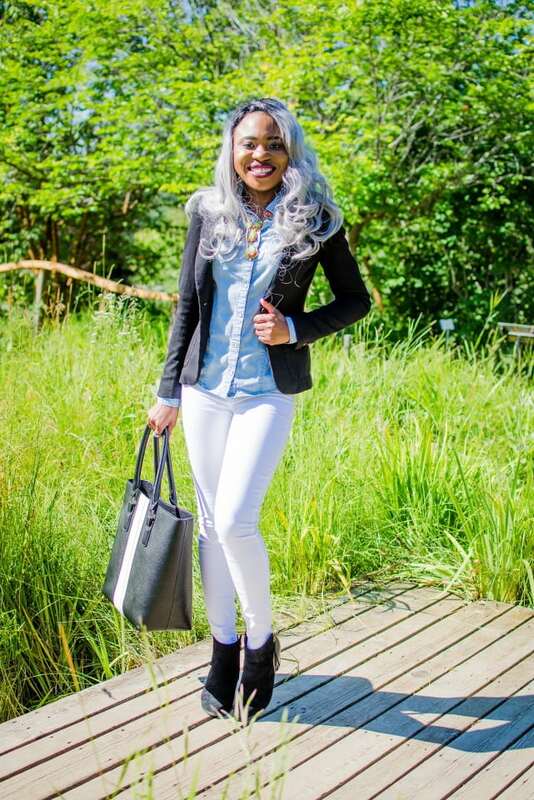 She is a fashion blogger and law student who started blogging back in 2009. 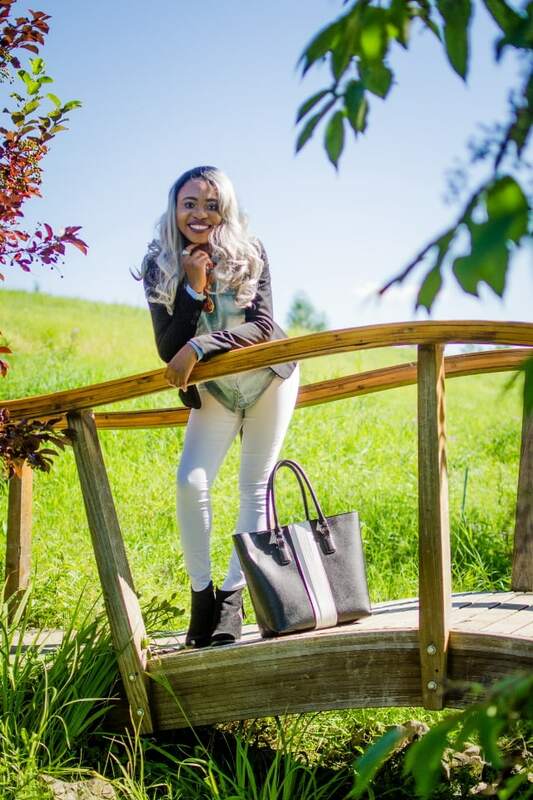 If you ever plan a trip to Toronto make sure to check out her blog to find out the best things to do in Toronto. Natalie got you covered! Her style is infused with a fun and chic, girly appeal. She seriously wears the most gorgeous summer dresses. Check her out on social (Instagram, Facebook) for some badass outfit inspiration. For this look, chambray shirt outfit, we wanted to style a piece of clothing that could easily transition from summer to fall. It is only August but we’ve had a lot of 50-60 degree weather in Alaska so I chose a layered chambray shirt look. 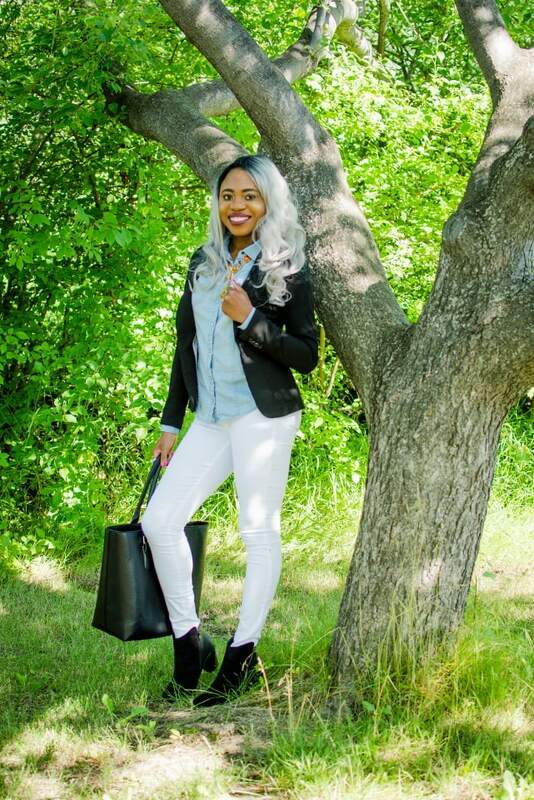 I paired a light-wash chambray shirt with a black fitted blazer that can easily be removed if I got too warm. To brighten up my look, I chose a white skinny jeans and a teardrop necklace for some color. 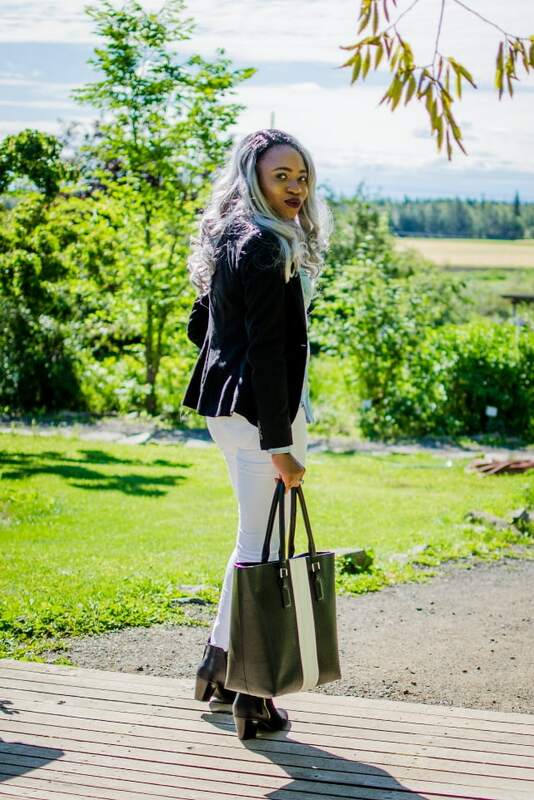 I completed my look with ShoeDazzle leather ankle booties and a two-tone JustFab tote to match. 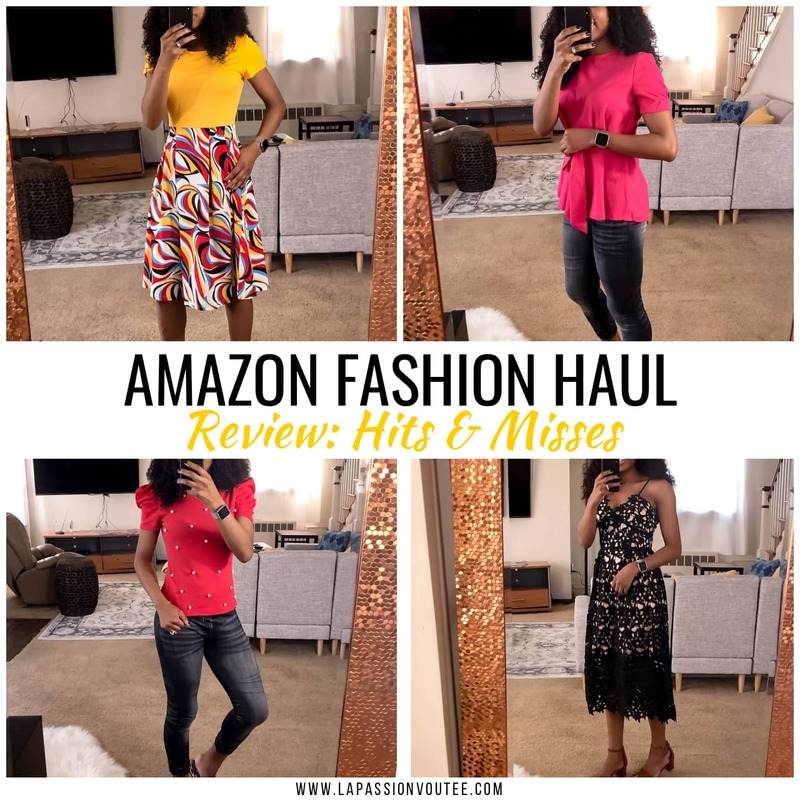 ShoeDazzle and JustFab are definitely two of my favorite brands. Probably more than 60% of my shoe collection is made up of these sister brands. Natalie went for a more summer inspired chambray shirt outfit. 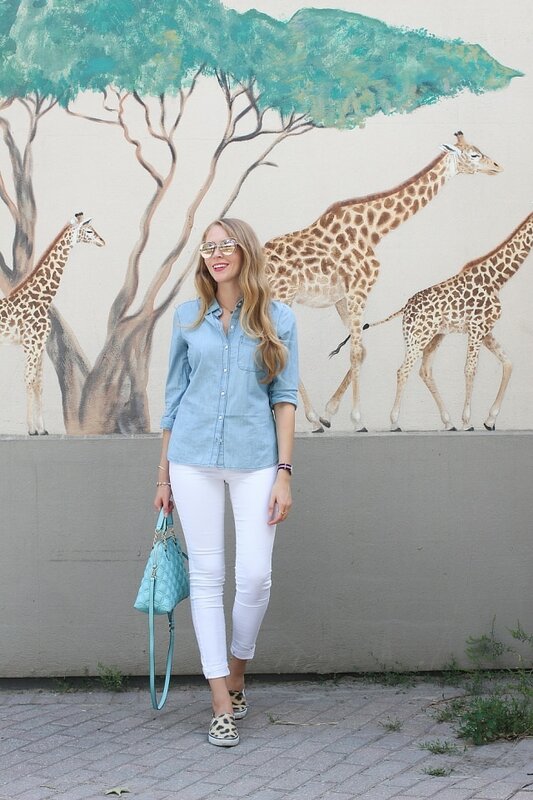 She paired a button up chambray shirt with a pair of Old Navy jeans rolled up at the ankle. She sizzled up her look with an uber chic mirrored glasses. She finished her look with a comfy leopard slip-on sneakers and a lovely Kate Spade bag. Don’t forget to check out her blog, Natalieast to see the rest of her look. Natalie and I had a lot of fun creating this chambray shirt outfit. I was actually pleasantly surprised when I found out that we wore almost exactly the same look. One look more fitted for summer and the other more fitted for fall or cooler weather. Hope you enjoy this look as much as we did! Oh man, and I’m here wishing mine were a little bigger 😀 Thanks for stopping by Mary! Ooohhhh, I love a good chambray shirt!! Super cute looks!! You guys both have such amazing style! I love this idea of collaborating to show the various ways to style one item! Thank you Roxy! I enjoy collaborating with other bloggers. It totally is a fun way to show how to style certain pieces in different ways. What a fun collaboration! 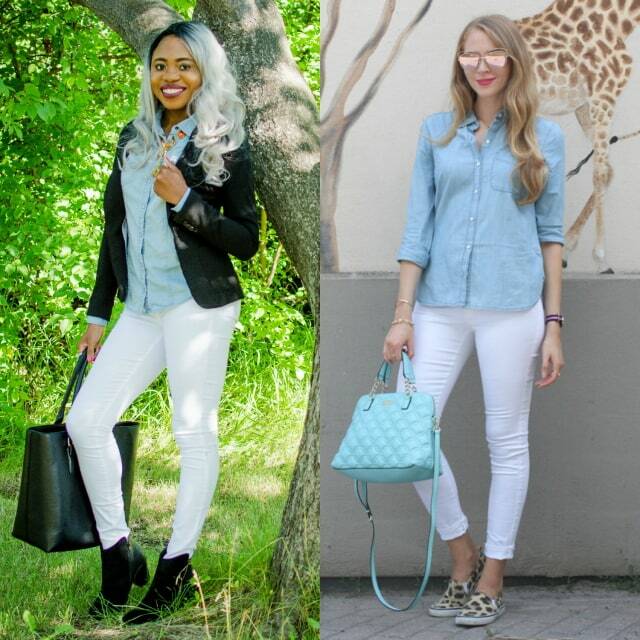 You both styled the chambray shirts so gorgeous! I’d wear it both ways! 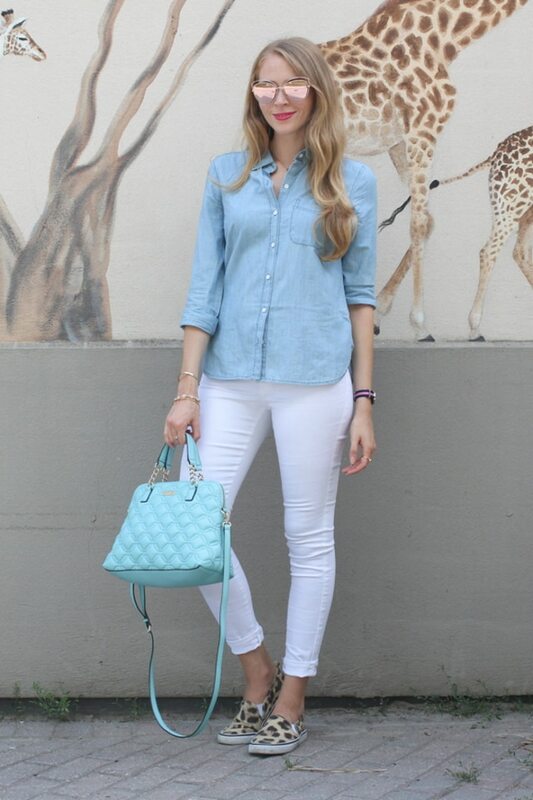 Chambray is such a staple. I never feel like I can pull off a button down short but you two make it look so easy! So sweet of you Lauren! Loooove this… yall looking cute and Louisa your hair is banging.